Whisk yolks and sugar in saucepan until well blended, then whisk in milk and cook over medium heat, stirring, until mixture begins to boil. Allow it to boil gently for a minute or so, stirring constantly as it thickens. Remove from heat, let it cool down some before covering tightly and chilling in fridge an hour or so. Whip egg whites in clean dry mixing bowl until soft peaks form. 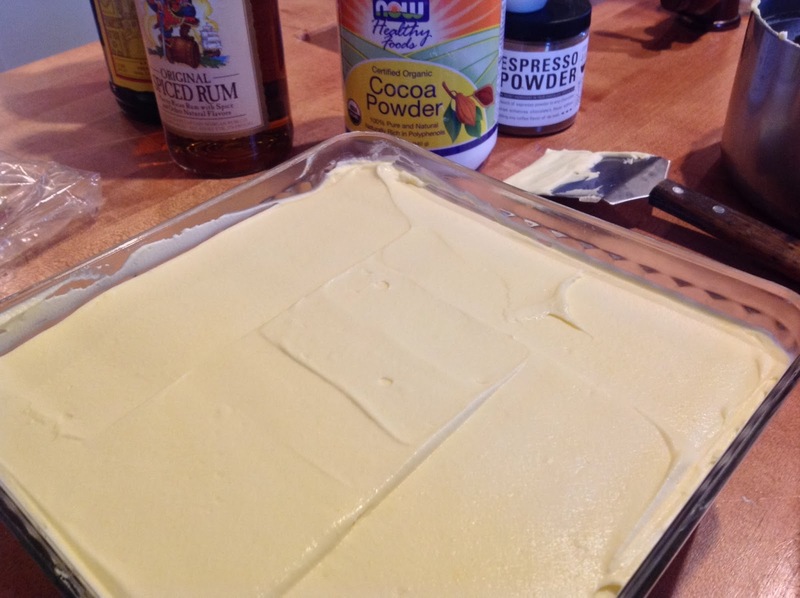 Pour into a separate bowl, then beat heavy cream with vanilla until stiff peaks form. 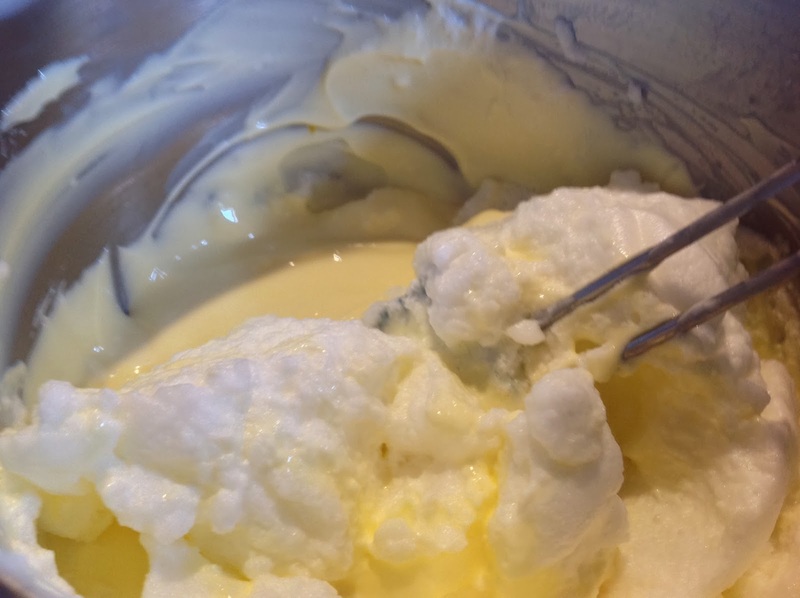 Gently but thoroughly whisk/fold until smooth (in this order): first, mascarpone into the cooled yolk mixture; second, whipped cream; third, egg whites. Combine the coffee and liquors in a dish that can accommodate the size of the ladyfingers and so that the liquid is not too deep. A casserole dish works well. 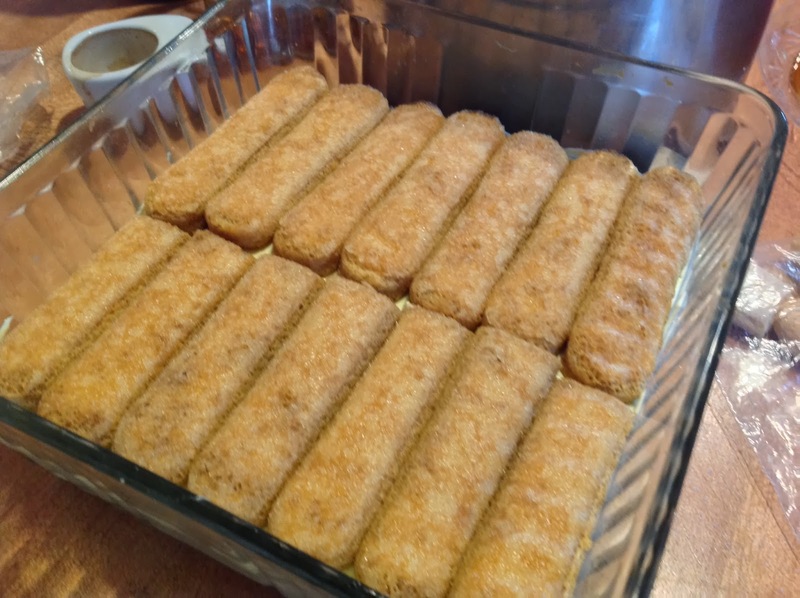 Do a “dry run” with the ladyfingers to size them up so they fit the glass dish you’re going to use. Cut to size the number of ladyfingers you’ll need to complete two layers. One at a time, lay each ladyfinger in the coffee mixture to the count of 2 seconds on each side. You do not want to soak them through. Continue with the full-size and cut pieces of ladyfingers until the bottom of the dish is thoroughly covered, then spoon half the mascarpone mixture on top and smooth out evenly and flat with an offset spatula all the way and cleanly to the edges. 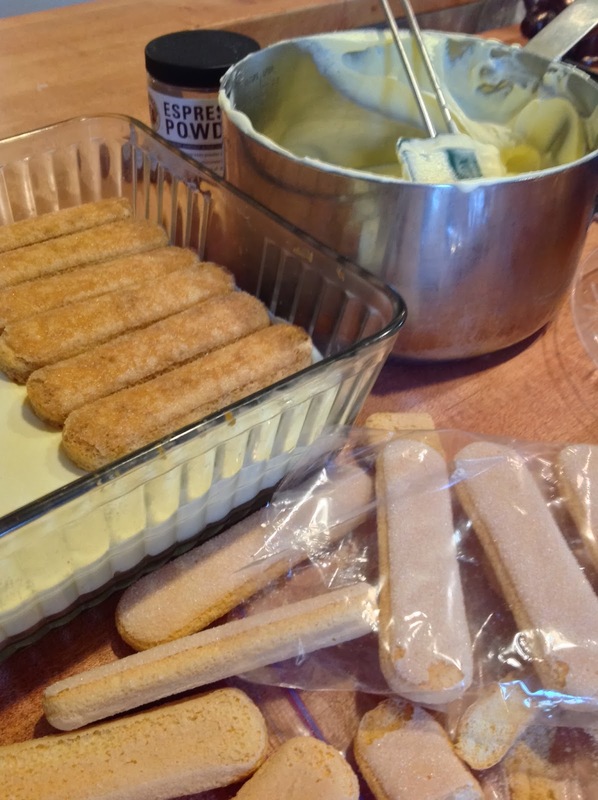 Apply second layer of dipped ladyfingers, then second layer of mascarpone, smoothing out flat to edges. Use a small hand strainer to evenly sift on a top coat of cocoa (with that optional pinch of espresso powder mixed into it). Cover and refrigerate 6 to 24 hours. Before serving, garnish as desired; i.e., a chocolate-covered coffee bean “flower” in the center and/or whipped cream stars around the edges. Clear glass will show off those luscious layers. My favorite vessel for tiramisu is this square old-fashioned glass refrigerator dish which came with a fitted glass lid. Single-servings in fancy glasses are great for individual place settings, or a trifle bowl with upright ladyfingers along the perimeter like a charlotte for a dinner party centerpiece. You’ll need extra ladyfingers for a trifle bowl, of course. Regardless of your chosen vessel, the last thing you want is to be short of fingers, so buy two 8-oz packages if larger packages aren’t available. 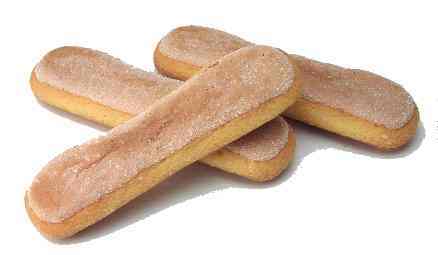 Ladyfingers are great coffee dunkers any time of day! Use the crisp ladyfingers called Savoiardi, like Bellino brand, not the soft cake ones. I use more eggs than most recipes call for, and most call for just using the yolks. I live on a farm and have a ready supply of fresh eggs, plus I do like it very light and airy, thus the whipping and folding in of the egg whites. You don’t have to use the whites at all, especially if you prefer your mascarpone custard layer a bit on the denser side. Always use the freshest eggs possible, at room temp if whipping the whites. Mise en place. Measure out exactly how many cookies fit whole and then how much of the ends of others you’ll need to slice off to make a tight fit. Cut them in advance and have everything at the ready when you start to assemble so you can work kind of quickly. Err on the generous side when you cut the Savoiardi ends as they’ll become more pliable once dipped and the presentation is always lovelier when the biscuit layers are distinctly visible. Place the rounded side out, cut side against the other biscuit. Don’t oversoak the biscuits – they’ll disintegrate. They’ll soak through just right as the dish sits in the fridge overnight (6 hours minimum). The longer it sits, the better it tastes! 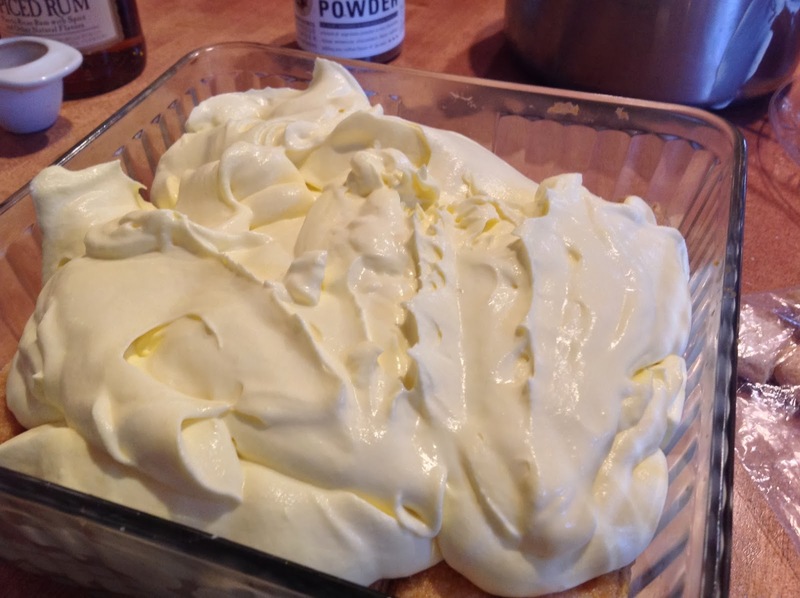 Don’t let the egg whites sit too long once they’re whipped because they’ll start to weep and you don’t want any runny whites when you fold them into the mascarpone mixture. As far as the liquors, feel free to suit your personal taste. You could use Frangelico or Amaretto. I like the rum and Kahlua. My Italian friend uses Strega. Next time, I’m definitely going to try the Van Gogh Double Espresso Vodka! 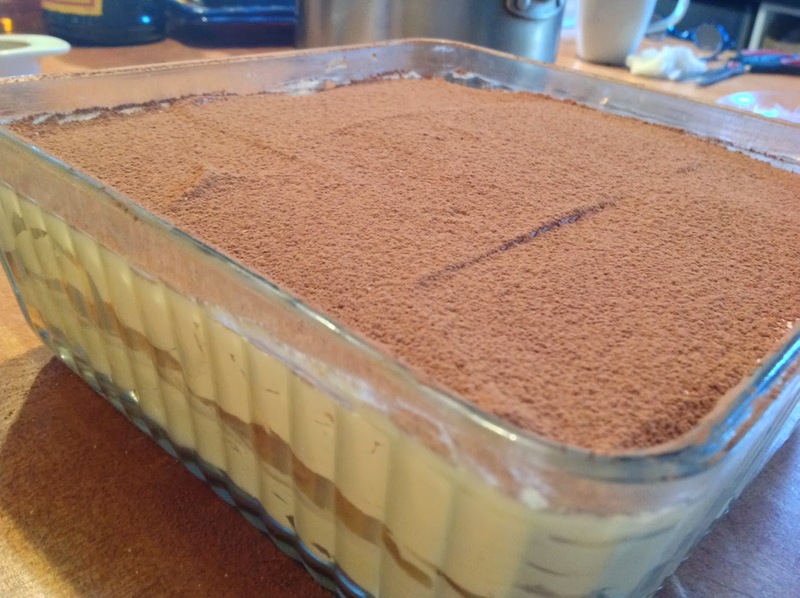 I’ve sensed some intimidation, a stigma of sorts, associated with making a tiramisu, that it’s complicated, “advanced,” or the ingredients are hard to find. Not so. Nearly every grocery chain nowadays has specialty and ethnic sections, or at least a wider variety of ethnic foods. Mascarpone may be with the specialty cheeses. I’ve tried a lot of different recipes over the past 30 years, tweaking this one and that one until I came up with this lighter, airy version… which is just the way I like it. Hope you like it too!